In a sprawling working class parish founded by Jesuit Father Jorge Bergoglio long before he became archbishop of Buenos Aires and later Pope Francis, the faithful are lamenting the results of Argentina's November elections in which businessman Mauricio Macri was elected president. "In my parish, people are not happy. They worry about employment and housing and pensions for the retired, and they fear these things aren't going to get the same attention in the new government as they did in the old government [of President Cristina Fernandez de Kirchner]," said Jesuit Father Rafael Velasco, pastor of St. Joseph the Patriarch Parish in San Miguel, located on the outskirts of the capital city. However, Velasco told Catholic News Service, many of the country's bishops are feeling "a great joy" that Macri won. He said the new government promises to return the church to its position of privilege, something that changed during the 12 years of rule by Fernandez and late husband, former President Nestor Kirchner, when conflicts over abortion and gay marriage further stressed already strained church-state relations. As a sign that the clock is turning back, on Dec. 11, Macri designated Santiago Manuel de Estrada as the new secretary for religious affairs. De Estrada, a 79-year-old Catholic who has long been dubbed "The Bishop," was secretary for social security during the 1976-83 military dictatorship and later served as ambassador to the Vatican during the government of Raul Alfonsin. He is considered a close ally of the country's most conservative bishops. The Vatican sent Archbishop Eliseo Ariotti, papal nuncio to Paraguay, as its representative to Macri's Dec. 10 inauguration. In this polarized political culture, many here interpreted the lack of a higher representative of the Vatican—as well as the pope's failure to comment publicly on the election results—as a slight to the new president. The losing presidential candidate, Daniel Scioli, who represented the continuation of Fernandez's brand of Peronism, is an old friend of Pope Francis. They maintained their friendship and frequent meetings even during the years when Fernandez considered the then-archbishop the spiritual head of the opposition. "Scioli was the one in the government who went to visit Bergoglio when it was prohibited by Fernandez to talk to him," Father Velasco said. But the priest said both Pope Francis, whom he claims privately backed Scioli, and the bishops, most of whom favored Macri, maintained public neutrality during the campaign. Father Velasco, who previously served as rector of the Catholic University of Cordoba, said the narrow election margin should not be interpreted as a sweeping mandate for Macri's conservative agenda. "Fernandez treated people in a way that many voted against her for her administration's corruption and arrogance. They voted against a government that didn't listen to anyone and was always fighting with everyone, often unnecessarily. It's like in football; sometimes it's not which team wins, but which team loses. And what happened here is that the old government's style led to it losing at the polls. Some working-class people voted for Macri against their own interests because they were tired of the model of government of Fernandez," Father Velasco said. One controversial theme that promises to outlive the electoral campaign is what will happen to those accused of torture and murder during Argentina's Dirty War. On Nov. 23, the day after the election, the daily newspaper La Nacion published an editorial titled "No more revenge," in which it called on the new government to put an end to the arrest and trial of hundreds of former military officers linked to the worst repression of the military dictatorship. Yet the editorial may have had the opposite effect, as dozens of employees of the newspaper disavowed the piece with a group photo that quickly spread through social media, with people holding signs saying, "I repudiate the editorial," or bearing the hashtag #NuncaMas, or Never Again. "The trials of those who committed genocide show before the world our path to justice, and we hope that this new government doesn't throw to the ground all that we've achieved at great cost up to now, that it doesn't turn its back on the people who remained in the hell of the concentration camps," Nora Morales de Cortinas, a founder of the Mothers of Plaza de Mayo, told Catholic News Service. Another Catholic human rights activist said Macri will not be able to erase the historic memory of repression. "Governments come and go, but the people remain. And the people have memory, a memory which illumines the present. It doesn't matter that we now have a government which isn't interested in human rights, because the people have memory and we'll continue struggling," Adolfo Perez Esquivel, who won the 1980 Nobel Peace Prize, told Catholic News Service. "Macri has always considered human rights to be a worthless stupidity," Perez said, but added that the new president would be unable to totally block the continuing trials because he lacks a parliamentary majority. Washington Uranga, an editorial columnist for Pagina 12, said Macri has already ordered cuts in funding to the Space for Memory and for the Protection and Defense of Human Rights, which is located on the grounds of a former military facility in Buenos Aires that served as a torture center during the dictatorship, and from which prisoners were dispatched on "flights to the death" where their bodies were thrown into the sea. "There will still be some money for personnel, but the Space will change into a simple museum, not a place for dialogue and expression where people could actively seek to recover the memory of their country," Uranga told CNS. Estela de Carlotto, president of the Grandmothers of the Plaza de Mayo, which with support from the former government has recovered 119 grandchildren whose parents were murdered by the military, said the new government's positions cause her worry but not fear. "We will accept what they do well, and we won't accept what they do badly. We remain committed to memory, truth and justice, and we grandmothers are going to continue to struggle to find the hundreds of grandchildren who remain," she told CNS. "We are looking forward to meeting with the new authorities to see what will happen with human rights. We want to promote unity among Argentines. Division has been promoted here a lot, as if whoever thinks differently from me is my enemy. 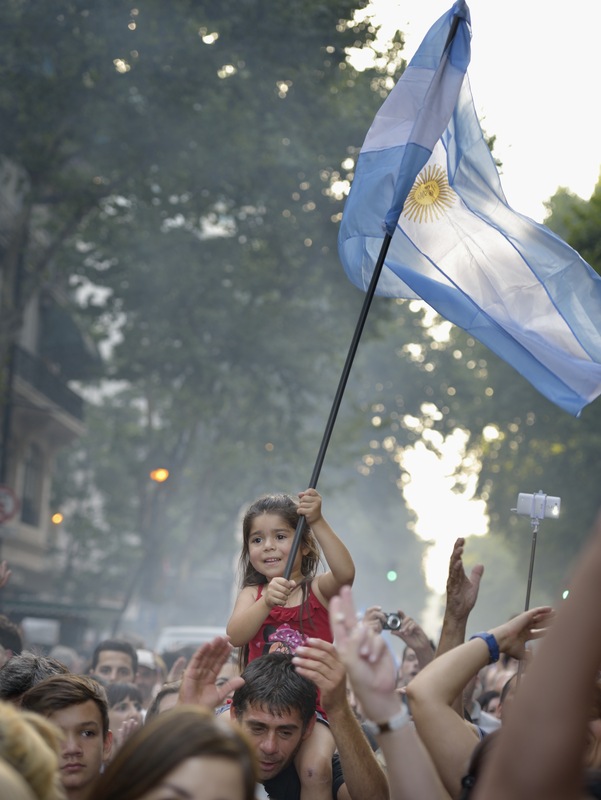 Yet they aren't enemies, they are just Argentines who think differently," she said.